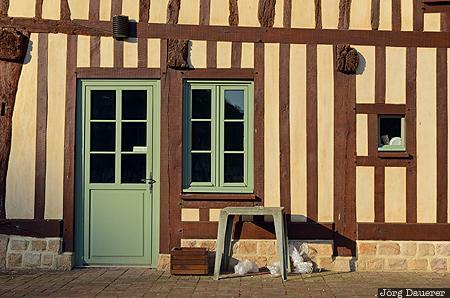 The facade of a half-timbered house in Le Bourg-Dun with a green window and a green glass door illuminated by warm morning light. Le Bourg-Dun is at the Côte d'albâtre in the Département Seine-Maritime in Haute-Normandie in northern France. This photo was taken in the morning of a sunny day in May of 2011. This photo was taken with a digital camera.